Individual crystals are too small to be seen by eye. Color typically green (color of chlorite) but ranges gray to black (organic matter), to green, red, purple, brown (iron oxides). At higher grades of metamorphism organic matter and iron oxides are recrystallized and rock becomes color of minerals. Slatey cleavage foliation composed of the lining up of the basal cleavages in the new chlorite and/or muscovite minerals. The result is slatey cleavage, the breaking of the rock into sheets along smooth, flat faces - as seen in this specimen. A distinct, weak sheen (light reflectance) is generally visible on cleavage faces, as seen here. The sheen shows up best when the rock is rotated in the light. 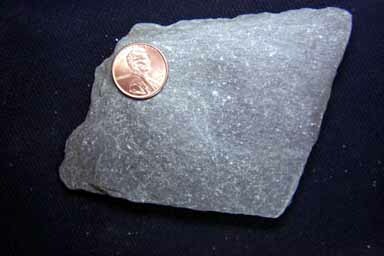 The rock will often " ring " like a bell when tapped on a hard surface, another feature not found in the shale parent, or the next rock in the metamorphic sequence, phyllite.